The return of Colin Miller to the Golden Knights’ lineup should lift the spirits of every VGK fan. Even if you don’t think he can save the Knights’ listless power play, getting the 26-year-old defenseman back on the ice is huge, both in the short term and especially long-term. Miller missed 13 games after being injured Dec. 17 at Columbus. He confirmed after Saturday’s 7-3 win over the Pittsburgh Penguins that he had a concussion and given the length of time he was out, that makes sense. As we learned with Marc-Andre Fleury last year, you don’t cut corners with concussions. You let the brain heal, you get your bearings back and only then, when you are ready, do you return to the ice. It was a very good performance. He logged just under 19 minutes of ice time, had two assists, was a plus-3, took six shots though only one was a shot on goal, blocked a shot and had a couple of hits. Best of all, he had no issues after the game. Yes, Jon Merrill and Brad Hunt did a good job filling in for Miller for more than a month while he recovered. And for Merrill, it appears he’s going back to the press box as a healthy scratch for now. He’ll handle it professionally and he showed he is worth keeping around. So why is it really important that Miller is back? He is one of the team’s best skaters and can move the puck out of his own end with his wheels. He also knows where his forwards want the puck and he is adept at getting it to them in the right spots. He also brings some continuity back to the blue line. Gerard Gallant paired Miller with Nick Holden and that means he’s part of the third defensive pairing and it means he doesn’t deal with the opposition’s top forwards as often as Nate Schmidt and Brayden McNabb do. Though with the Penguins, he found himself dealing with Geno Malkin and Phil Kessel, two top forwards. So with Miller’s return, the third pairing has bolstered the overall lineup. As for the power play, one guy isn’t going to suddenly turn the Knights into an elite unit, though they did convert in the 1st period as Gallant used Nate Schmidt and Shea Theodore at the points and Theodore scored on a one-timer off a feed from Schmidt. But Gallant said the other day that when Miller is shooting the puck from the point and it gets through, he does give the Knights an added dimension. Miller was shooting at every opportunity Saturday, no hesitation whatsoever. He just didn’t hit the net as often as some would’ve liked. He has 19 points in 37 games and is the leader among the team’s defensemen in scoring. So he’s going to provide offense from the blue line and that’s going to be an important factor. Remember, he had a career-high 41 points last year, including 10 goals, playing an entire season. He may not get to 41 points this year because of the time he missed. But he will add to his numbers over the remainder of the season. His pair of assists, the first coming on Jonathan Marchessault’s second goal late in the 2nd period, was started by a smart pinch (see video below) in the Pittsburgh end and then regaining possession after allowing the forecheck to force a turnover. The second helper came on William Karlsson’s redirect goal that made it 6-3 with 6:15 left to play in the game. As Miller said, simply sending the puck goalward and letting Karlsson take care of the rest. It’s these kinds of intelligent plays that will help long-term. Making the right decisions and being able to transition quickly is what Vegas does the best when it’s on its game and Miller has gotten better at his decision making. Having Miller back for the long term also helps with the continuity. 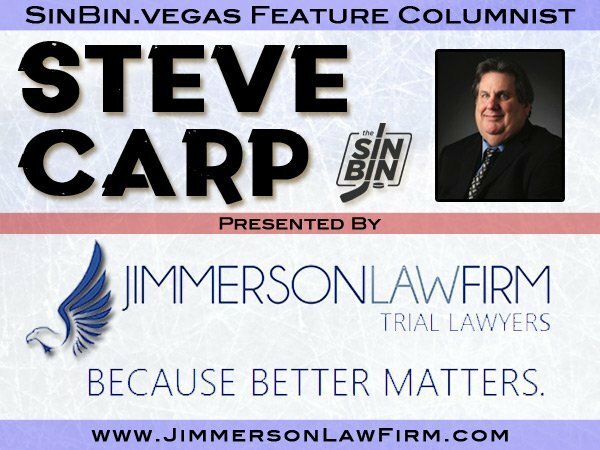 As the Knights look to get their regular lineup back with Reilly Smith and Will Carrier, it gets them closer to being whole as a roster. It also enhances their chances of winning the Pacific Division. And considering the ground they’ve made up with regulars injured the last month or so, the fact Vegas is one point out of second and seven behind first-place, red-hot Calgary with 32 games left is hardly insurmountable. Miller will be an important part of things going forward. He’ll get a couple more games under his belt Monday against Minnesota and Wednesday against Nashville, then use the extended break to prepare for the stretch drive. Remember, he had never missed a game in a VGK uniform prior to Dec. 17. So assuming there are no further mishaps, look for No. 6 to be a fixture on the blue line, on the power play and logging plenty of minutes the rest of the way. Just a word about Marchessault if I may. He had been snakebit for the past 11 games, missing open nets, hitting posts and crossbars and you could see the exasperated look on his face. His hat trick Saturday may get him on his way. 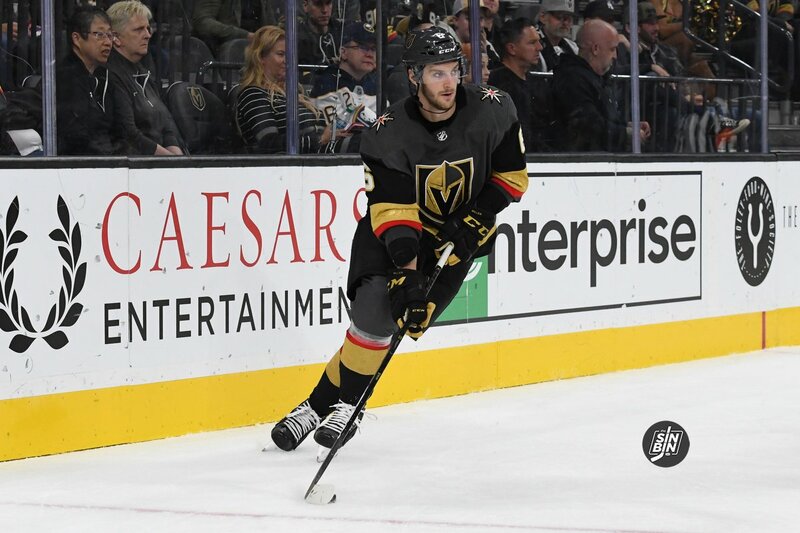 I had said on a couple of radio talk shows earlier this week that Marchessault’s work ethic would eventually get him back on track and while he was obviously frustrated, his performance Saturday will undoubtedly boost his confidence. And with goal scorers, confidence is everything. Suddenly, the net will look as big as a soccer goal for Marchessault after it probably appeared to be the size of a thimble. Don’t be surprised if he goes on a tear the next few games. Ditto for Karlsson.